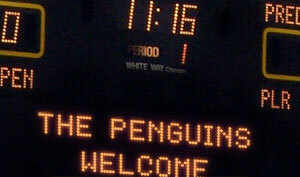 I was recently asked to put a custom message on a score board (or scoreboard depending on your spelling pref). The best solution I came across was the font, Times Square available for free download here. It was designed by Charles Minow in 1996. It’s a TrueType font, so it will work on both Macs and PCs. However, be a little wary about using it for professional printing. It could have some issues. You’re best bet is to outline the font after use. I was using in a Photoshop image so I wound up rasterizing it before I did all my skewing and distorting. Complete image size: 1932 x 2576 pixels. Size of portion with Photoshopped text: 367 x 194 pixels. The size of the Photoshopped portion is a factor when trying to replicate this effect. Can you post what you did with the scoreboard font? I updated the post to include the Photoshop settings used.